Join guest host, Mark Johnson FAIA for a sneak preview of two exciting show homes opening this February at the International Builder Show, and in April at Epcot® Theme Park in Orlando. We’ll be taking a look at the sustainable products specified in each home. The VISION House® in INNOVENTIONS at Epcot® is a ground-breaking green show home exhibit presented by Green Builder Media® in collaboration with Walt Disney Imagineering. This experiential exhibit in the heart of Epcot® highlights the very best in green residential design and sustainable living, and will open this spring. Visitors will leave with a greater understanding of green design, technology, and products as well as a host of sustainable living ideas that they can incorporate in their lives the minute they get home from vacation. Sponsors for this exciting project include Trane and Schlage (Ingersoll Rand brands), Boral, Panasonic, Armstrong, Kohler, Siemens and GM. The Cool Energy House project is a deep-energy remodeling demonstration house produced by the Building America Retrofit Alliance (BARA), with the Consortium for Advanced Residential Buildings (CARB) teams. Using innovative building optimization software created by Building America, ideal retrofits and updates were identified and implemented to reduce energy costs and make the home safer and more comfortable, all while keeping total costs low. The project will be featured at the 2012 International Builders’ Show. Sponsors for the house include Johns Manville, Simonton Windows, Panasonic, the Metal Roofing Alliance, and Dupont Tyvek, with additional contributions from Therma-Tru, Fypon, GE, Hayward, Lennox, Honeywell, BASF, Formica Group, BEHR Paint, and the Structural Insulated Panel Association. 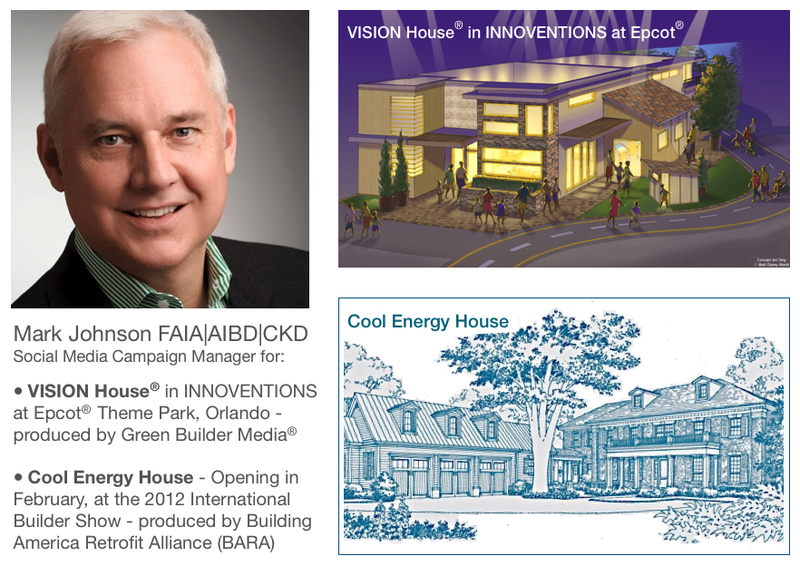 Click the link here to see Mark’s Pinterest boards for The Vision House and The Cool Energy House.